Our monthly residential market review is intended to provide background to recent developments in property markets, as well as to give an indication of how some key issues could impact in the future. The latest Royal Institution of Chartered Surveyors' (RICS) 'UK Residential Market Survey', concludes that demand for property slipped lower for a second successive month in September. They attribute this fall in demand to a combination of factors, including a lack of stock, the interest rate rise, economic uncertainty and affordability constraints. At a national level, RICS believe that house prices have been relatively unchanged over the last five months. The survey outlined that average stock levels on estate agents' books were close to record lows in September, as the volume of new sales coming to the market deteriorates. New buyer enquiries slipped to -11%, compared to -9% in August. According to recent figures from HM Revenue and Customs, the amount collected in Stamp Duty tax on residential property purchases rose by 8% to top £9bn, in the 2017-18 tax year. London accounted for 39% of Stamp Duty receipts, generating a record £4.9bn in revenue, despite housing market activity declining in the capital. Expensive properties accounted for a high share of the Stamp Duty revenue, with homes costing more than £1m producing 44% of receipts, while representing just 3% of transactions. 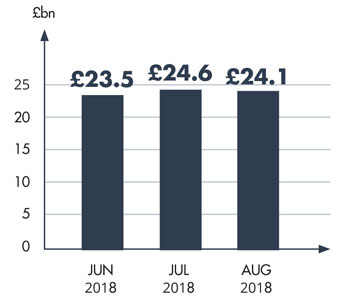 The introduction, in 2016, of an extra 3% Stamp Duty surcharge on additional residential properties was seen to be largely responsible for the rise in receipts over the year, generating £1.9bn in 2017-18. Lucian Cook, director of residential research at estate agent Savills, said: "The additional 3% clearly has paid dividends for the Treasury. That has largely been the difference between Stamp Duty receipts continuing to rise in what is a pretty turgid UK housing market with pretty flat transaction levels." The Prime Minister recently told the Conservative party conference in Birmingham that housing was: "the biggest domestic policy challenge of our generation" and announced that the government would scrap the current cap, introduced in 2012, on how much councils could borrow against the value of their housing stock. It is estimated that the value of council-owned housing stock is £230bn, which is nearly nine times their current level of borrowing. Council debt will still be constrained by prudential borrowing rules and by future uncertainties over income. The Chartered Institute of Housing welcomed the removal of the cap, but said councils need to focus on those areas where the private sector was not meeting needs. Gavin Smart, Director of Policy and External Affairs said: "We need to make sure we are building the right homes, in the right places, at the right prices. That's why it is so important to give councils the tools they need to build more truly affordable homes for social rent." "Overall house purchase completions remain stable, driven largely by the number of first-time buyers which reached its highest monthly level since June 2017." It is important to take professional advice before making any decision relating to your personal finances. Information within this document is based on our current understanding and can be subject to change without notice and the accuracy and completeness of the information cannot be guaranteed. It does not provide individual tailored investment advice and is for guidance only. Some rules may vary in different parts of the UK. We cannot assume legal liability for any errors or omissions it might contain. Levels and bases of, and reliefs from, taxation are those currently applying or proposed and are subject to change; their value depends on the individual circumstances of the investor. No part of this document may be reproduced in any manner without prior permission.